Choose The Perfect Electricity Plan in San Juan, Texas! Direct Energy works hard for more than four million home and business customers across the United States and Canada, and we compete to earn their business day after day. Don't worry about our size. We may be one of the largest residential energy retailers in North America, but we provide big-business know-how without giving up the commitment you'd expect from a local energy provider. Direct Energy has an abundance of specialized offerings across the United States and Canada to support your energy needs. We provide the insights needed for you to make smarter decisions, be more efficient, reduce your energy use and save money. In the Lone Star State, there are so many things to do besides thinking about your electricity, like letting the kids cool down by running in the sprinklers! Choose Direct Energy for low, fixed San Juan electric rates! You don't need to spend another mild and cool San Juan winter stressing about your electricity bill because with products and prices that are right for your home and your budget, Direct Energy has you covered. There is a wide range of plans available to you, from the Echo Dot plan to a fixed rate, which guarantees you a rate that will not change with the seasons. The perks that come with all of our plans extend beyond competitive electricity rates and superior customer service. Now that you've found your perfect plan, you can manage your energy usage, check out exclusive offers, and more with our Online Account Manager. It is your all-access pass to managing your account. We provide the knowledge and tools to help you become more energy-savvy and save on your electricity bill. Browse through our Learning Center to learn about energy in Texas and get energy efficiency tips to help you decrease the amount you spend on energy. Direct Energy is not your average electricity supplier in San Juan, Texas. Why not choose the company that grants you the tools and technology to Use Less of What We Sell when you have the power to choose your electricity provider? 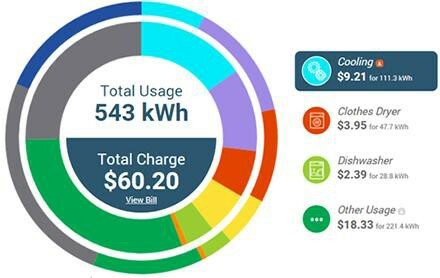 Direct Your Energy, a custom suite of energy usage insight tools, helps you see, understand, and manage how you use energy in your home. Your energy snapshot will help you make adjustments, if needed, so that you are in total control. You'll also benefit from a seven-day weather outlook and how that could impact your bottom line. Want to learn more about your energy use? Head to our Learning Center to access the extensive resources that are at your disposal. Direct Energy is dedicated to helping you care for your home and understand and manage your energy use. Want to live a more eco-friendly lifestyle? We have tips for that and more! You and your San Juan home need an energy company dedicated to you, not some average run-of-the-mill provider. Take control of your Texas electricity bills every month by making Direct Energy your energy provider today. Are you changing San Juan electricity providers? Or maybe you need new service? You can trust us to make the process simple. And if you're trying to decide between Direct Energy and Green Mountain Energy, learning more about the perks of being a Direct Energy customer will make your decision crystal clear. Looking for a plan with the stability of a fixed rate? Or maybe you like the freedom of a connected home bundle. No matter what your ideal electricity plan looks like, we have the one for you. We even offer you a way to simplify the process of paying your bill. Sign up for Paperless Billing and Auto Pay today by logging into the Online Account Manager! There are several things you can always count on, no matter which electricity plan you choose for your San Juan home - like fixed rates and great customer service! We empower you to make smarter, more informed choices with our energy insights tool, Direct Your Energy. Take a look at our educational resources to bump up your energy efficiency and save on your monthly bills. With a commitment to helping you save money on your electric bill, we separate ourselves from other electricity companies. In fact, we'll even reward you for consuming less with our Reduce Your Use Rewards! Sign up for Direct Energy today and start living smarter.